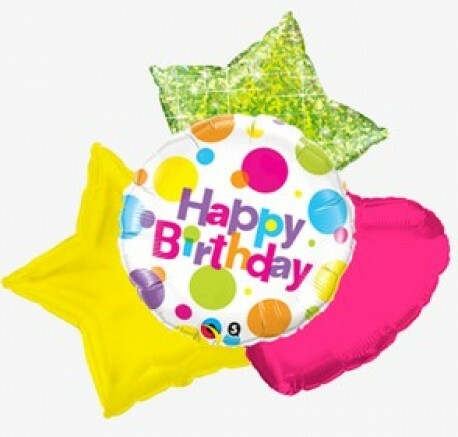 At Hillmans we are delighted to present 18 inch helium filled foil balloons. This product available for delivery with flowers in Hereford and the surrounding areasThey come in a wide variety of designs for all occasions and can be delivered as a single balloon or cluster added to any flower delivery. A colourful and fun addition to celeberate any special birthday, anniversary wishes, or an added extra for get well soon, welcome to the new baby, or thank you, plus many more special events. Delivered attached and floating above the floral gift with pretty ribbon and a weight added. Due to a constant and ever changing selection of balloons please specify for the occasion required and we will make the choice of balloon as we think appropiate to colour co-ordinate where possible the balloon and ribbons with the flowers chosen.